Durable and affordable decorative floor vents in a Manhattan design. These Accord Ventiliation floor registers feature a beautiful oil rubbed bronze plated finish. The decorative floor vents are sold with an adjustable plastic damper that won't rust. Oil rubbed bronze register covers are attractive and durable with a steel core that is rated to hold up to 200 pounds. 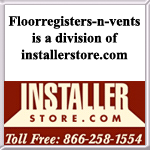 This decorative floor vent is available in sizes 4x10, 4x12, 4x14 and 6x10. 61-0937 4 x 10 5.25" x 11.5"
61-0938 4 x 12 5.25" x 13.5"
61-0939 4 x 14 5.25" x 15.5"
61-0940 6 x 10 7.5" x 11.5"
This attractive Manhattan decorative floor register design is also available in the finishes Antique Brass and Satin Nickel.